How do I Repair a Husqvarna Riding Mower Battery That Is Not Charging When Running? Husqvarna manufactures a wide variety of small-engine lawn equipment. The stator, or alternator, controls the charging system. The battery puts out 12 volts, but under normal use, it cannot maintain enough energy to keep the mower operating. The stator generates 14 volts and sends the electricity back to the battery to keep it fully charged. 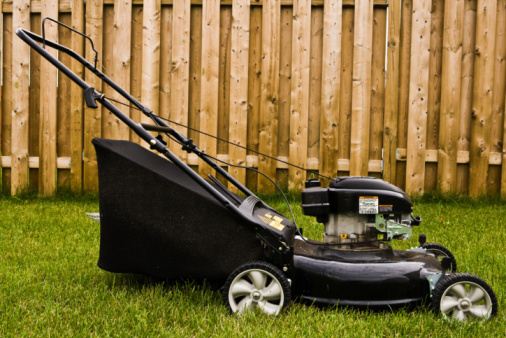 If the stator malfunctions, the battery will drain, causing the mower not to start. Changing out the stator takes knowledge of engine theory. This procedure takes about 45 minutes. Park the lawn mower on a hard, level surface. Set the parking brake. Start the engine. Turn on the voltmeter. Attach the red lead from the voltmeter to the positive terminal on the battery. Attach the black lead to the negative terminal. If it reads 14 volts, the charging system is fine. If it reads 12 volts, the stator is not working. Remove the five bolts surrounding the plastic engine housing with the socket wrench. Slide off the plastic housing, exposing the flywheel. Remove the three screws holding the screen on top of the flywheel using the Phillips screwdriver. Remove the four small bolts holding down the ignition coils located against the flywheel, and the spark plug wires are connected to them. Hook up the air wrench to the air compressor. Use the air wrench and socket to remove the nut holding down the flywheel. Install the flywheel puller by screwing it into the two bolt holes located beside the threads from were the nut was just removed. Tighten the flywheel-puller screws evenly to the flywheel until the flywheel loosens. Slide off the flywheel, exposing the stator. Remove the four screws that hold the stator against the engine block with the Phillips screwdriver. Pull out the connector that holds the stator to the wiring harness. Install the new stator. Screw the four screws into the engine block. Connect the wire from the stator to the wiring harness. Reinstall the flywheel, tightening the nut on top with the air wrench. Reinstall the four bolts holding down the coils. Reinstall the plastic engine housing. Start the engine, turn on the voltmeter and hook it back up to the battery. If the voltmeter reads 14 volts, the charging system is working properly.